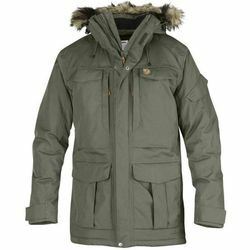 Fjallraven Yupik Parka. The Yupik is a large, sturdy parka with synthetic lining that reaches over the rear and thighs, the Yupik Parka has Supreme Micro Loft padding, a detachable hood with soft fleece lining and warm synthetic fur trimming for protection against snowstorms, plus practical pockets galore. The perfect parka in unpredictable, winter weather conditions to shield you from the rain and wind - whether polar or not.